Are you sick and tired of losing your keys? Well, you should consider letting us install a keyless entry lock system for your home or office. When it comes to lock services in Georgetown Texas, we are your fastest and most reliable local company. And despite what you may have heard, high-tech lock systems do not need to cost a fortune when you call on our installation and repair experts. We are Georgetown Locksmith Pros offering residential, commercial, automotive, and emergency locksmith services. We work with many different keyless entry locks, and our goal is to make sure that your property is as secure as possible. We offer 24-hour services because we understand that emergencies can happen at any hour. Instead of calling just anyone to take care of your needs, choose us because of our reliable and fast assistance. Smart locks have many advantages over traditional keys. Since there are no physical keys involved, you do not have to worry about getting locked out of your property because of a lost, stolen or broken key. With traditional lock systems, it is possible for someone to get a duplicate key made. Of course, keyless entry systems are much more secure. You can grant people temporary access to your home or business with smart locks and then change the pin code when their work is done. Handymen, workers, and others can come into your property for as long as you give them authorization. After that, they will not be able to get in. This means that you will not have to worry about rekeying your locks for extra security if you give someone access to your property. 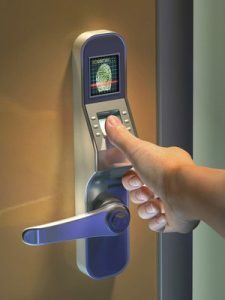 One of the most advanced systems includes biometric locks, but that’s not all! Digital locks are popular smart locks. You will have an access code that allows you to enter your property, and you can give it to anyone you trust. Electronic key card locks are good choices too. You can make keys to give people access to your property for as long as you want them to have it. When they are done, you can deactivate their key card so that it will not work anymore. Bluetooth-enabled locks are popular choices that can work with your smartphone, or you may want to have a lock that works with a key fob. There are many high-security options available, and we have the skills and tools needed to install and offer repair services on many premium keyless entry locks. Our locksmith services in Georgetown Texas are always done right the first time. We can work with commercial security systems to make sure that your property stays safe whether you are there or not. When you need an emergency locksmith for your home, we are here to assist you at any time. When you hire a professional local locksmith, you can be sure that your property is going to be secure. An insured and licensed locksmith will know how to set up a safe keyless entry system to keep unauthorized people from entering your property. Not only that, trying to install a high-tech system yourself could lead to expensive repairs later on. Or, if not installed properly, you could put your property at risk of being robbed. Georgetown Locksmith Pros offers quality results. Get in touch with us when you need fast and friendly locksmith services. We are proud to offer upfront pricing and excellent customer services. When it comes to your security, only choose a reputable company that cares about your security needs. Keyless Entry Locks https://georgetown-locksmith.co/lock-services/keyless-entry-locks/ 3.7/5 based upon 15 reviews.